The Foundation of CCC&TI, Inc. 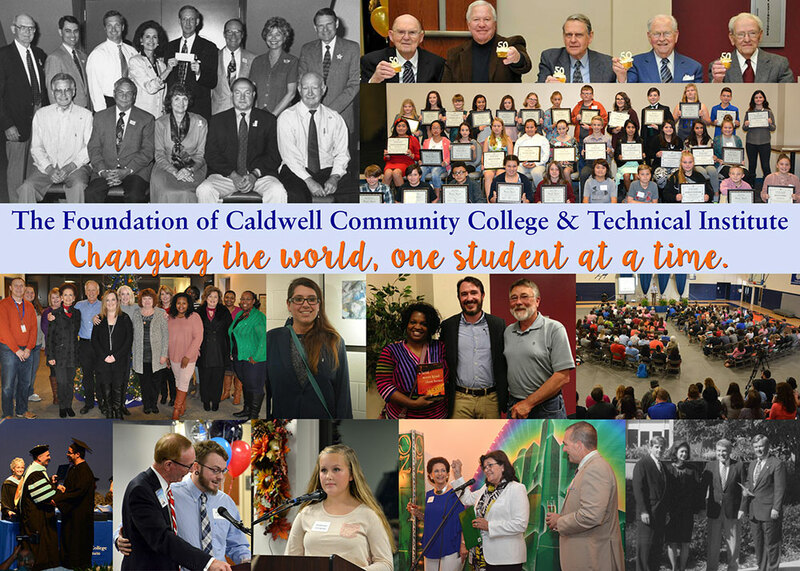 Helping students from our community is the main mission of the Foundation of Caldwell Community College and Technical Institute. The non-profit organization provides funding for scholarships, academic support, childcare and emergency assistance, counseling and professional development, along with various achievement awards and grants. The Foundation’s philosophy is that in changing one life, you are changing families and the future of our community by enriching lives and creating a stronger workforce. Read about the "Foundation in the News"
The Foundation’s Annual Fund Campaign is led each year by a large group of dedicated volunteers who believe in the power of education to change lives. Annual Fund dollars provide scholarships for students with unmet need, help fund the Dream Award Program, provide for emergency and childcare assistance for students and much more. Many people have the impression that the state provides for all of the college needs, but this is not true! The state does not provide enough funding for scholarships, work/study, childcare, counseling, other student aid, or changing technology. Technology is a rapidly changing field, and our equipment must be up-to-date for our graduates to successfully compete in the job market. State funds are simply not sufficient to meet the growing needs of our students or our institution. To see all the ways that the Annual Fund supports CCC&TI and its students, visit our "Changing Lives" page. The Foundation is especially grateful to the many individuals, businesses, foundations, and industries throughout Caldwell and Watauga counties who continue to lend their strong support every year. Also, we cannot express how much we appreciate our own faculty, staff, college trustees, foundation directors, college retirees, and alumni who know the needs first-hand and contribute generously to help meet those needs. You can help change lives, too! Every donation to the Foundation of CCC&TI’s Annual Fund Campaign makes a difference for students, for the institution and for our greater community. To find out more about how to make a donation, how donors are acknowledged for their gifts and special donor recognition programs, visit our Donor Recognition page. Mr. Guy A. Walters, Jr.